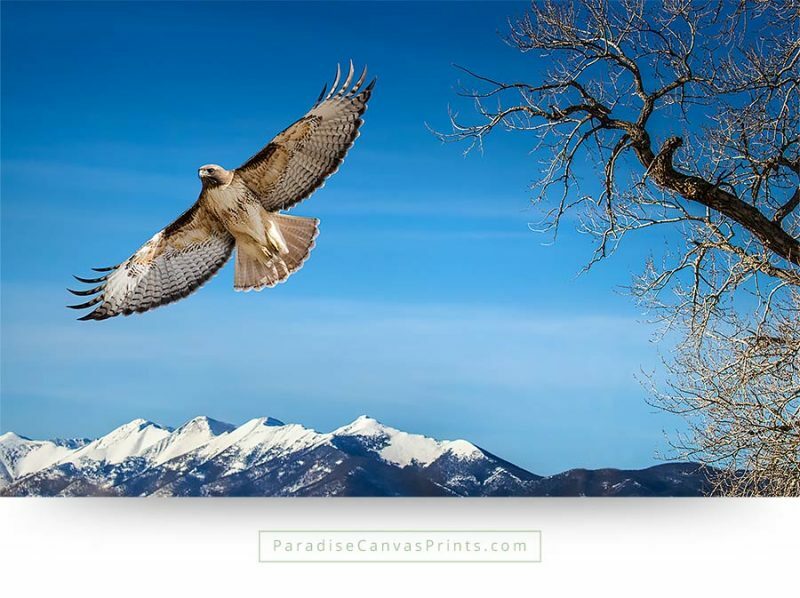 Bird canvas prints bring the splendor of paradise right into your home! 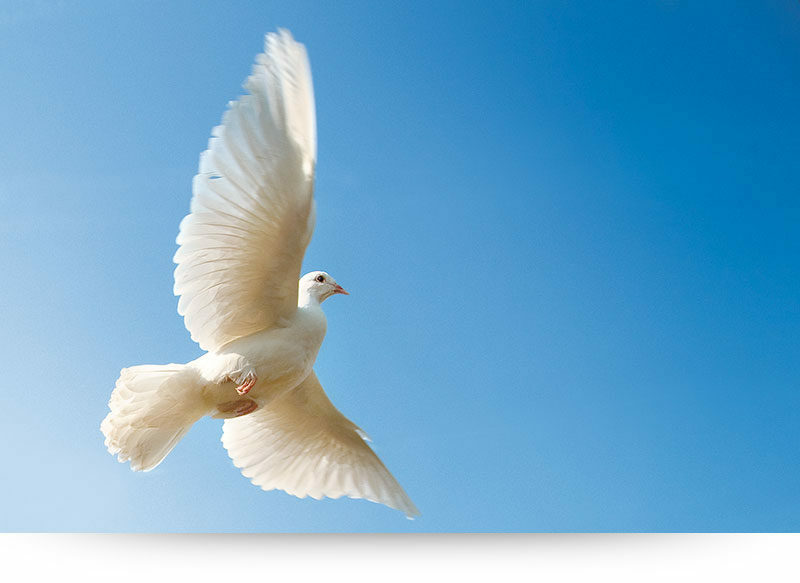 Did you ever see doves kiss each other? Isn’t it adorable? 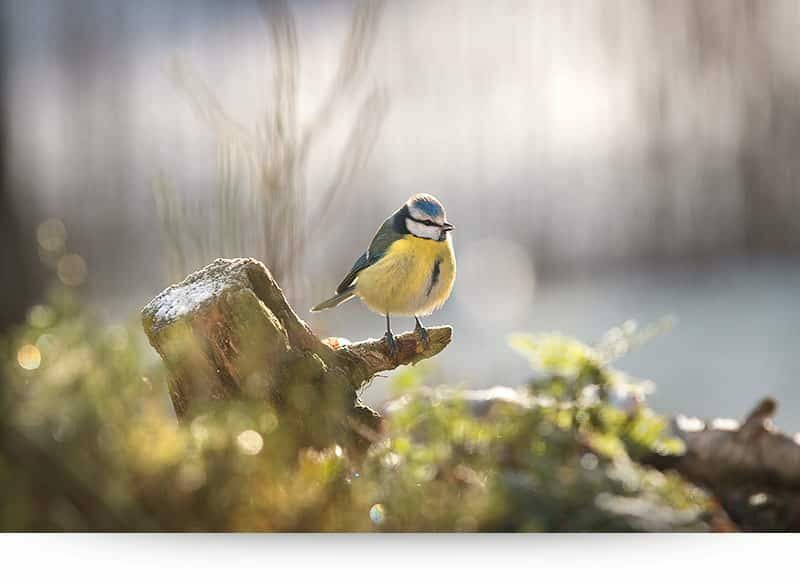 Imagine having this amazing nature image on a canvas print in our bedroom or living room? Wouldn’t that be stunning? 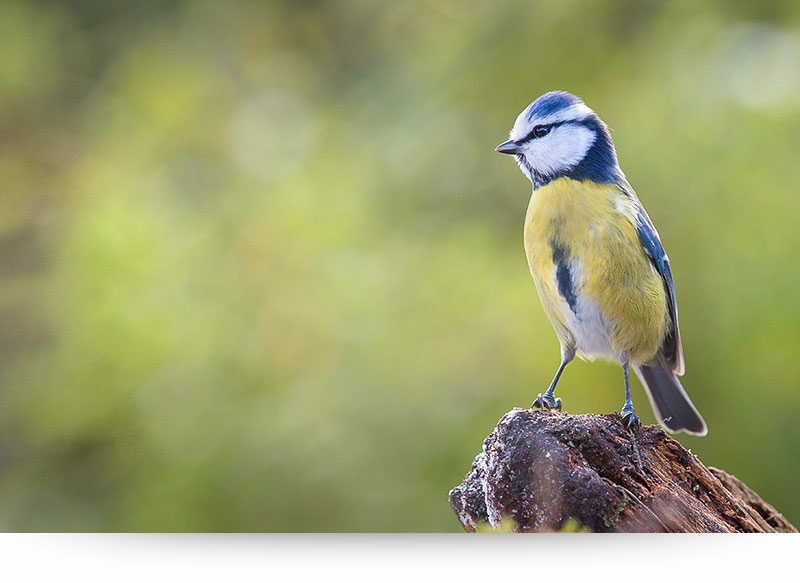 Or the gorgeous songbirds, with their joyful colors and cute little bodies? 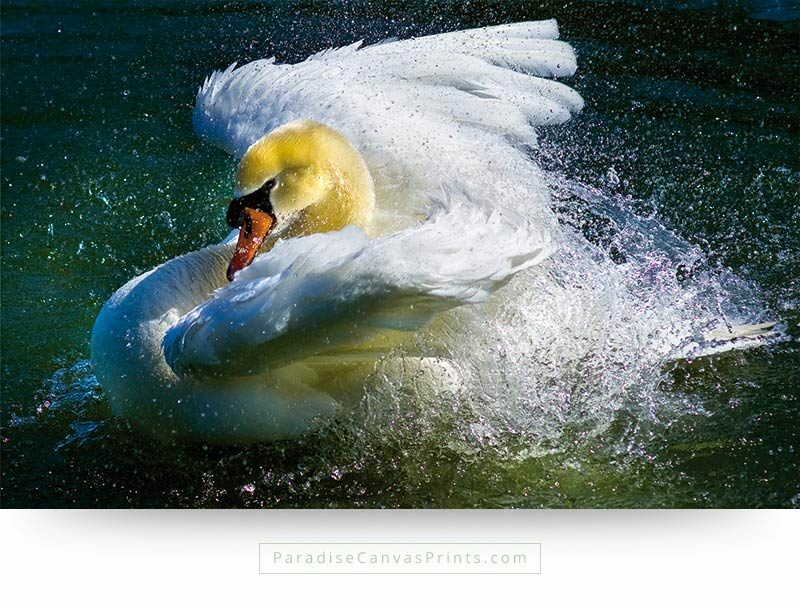 The majestic swans bring an atmosphere or royalty into every interior. Wonderful! 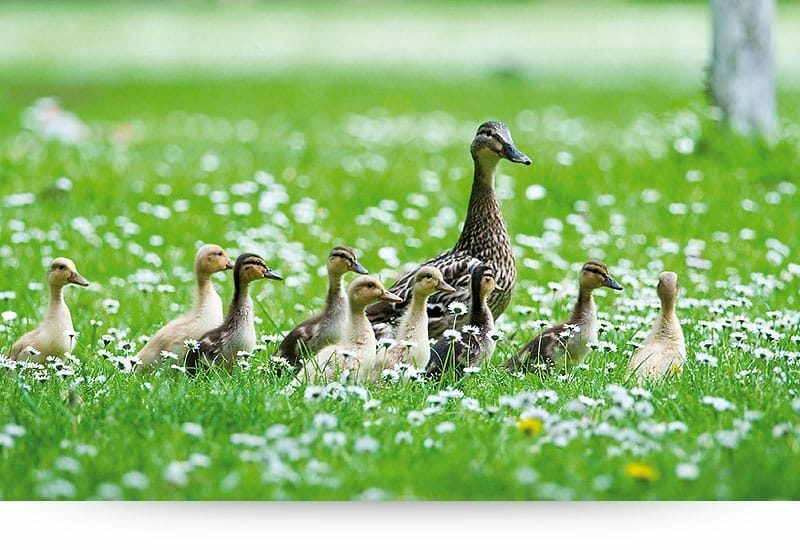 Don’t hesitate and bring the beauty of paradise right into your home! 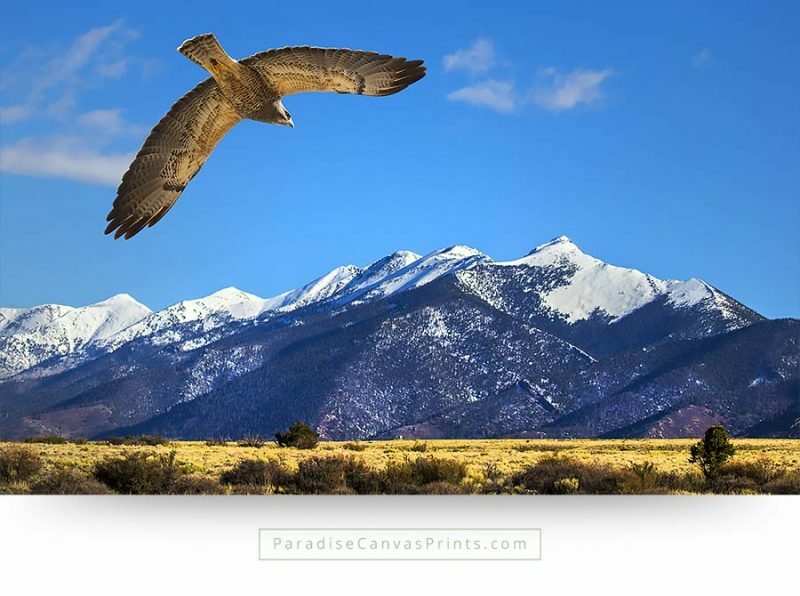 Bring paradise into your home with these bird canvas prints. 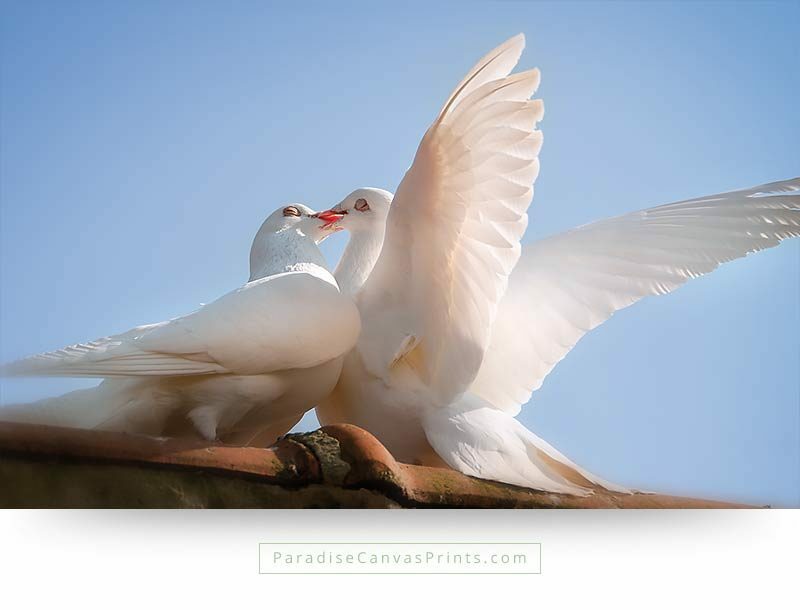 I could hardly believe my eyes when I saw these two white doves kiss each other. 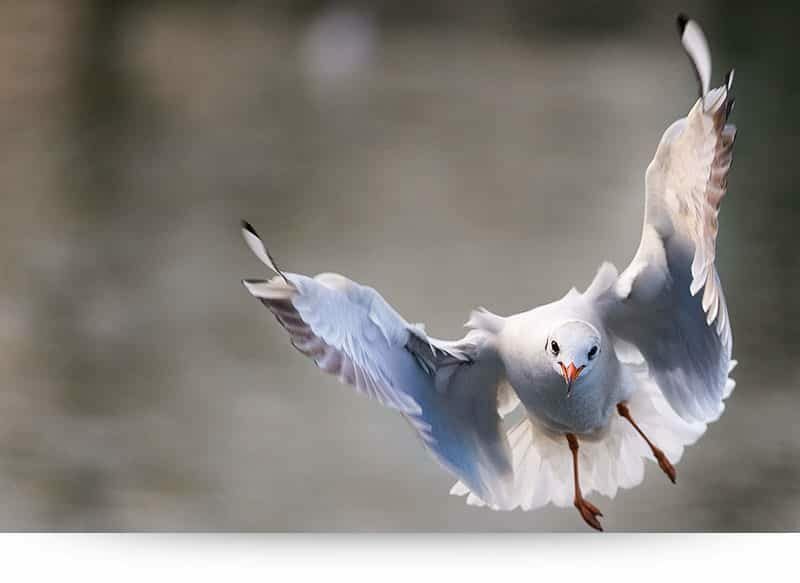 It’s beyond doubt the most romantic scene I have ever witnessed in nature. 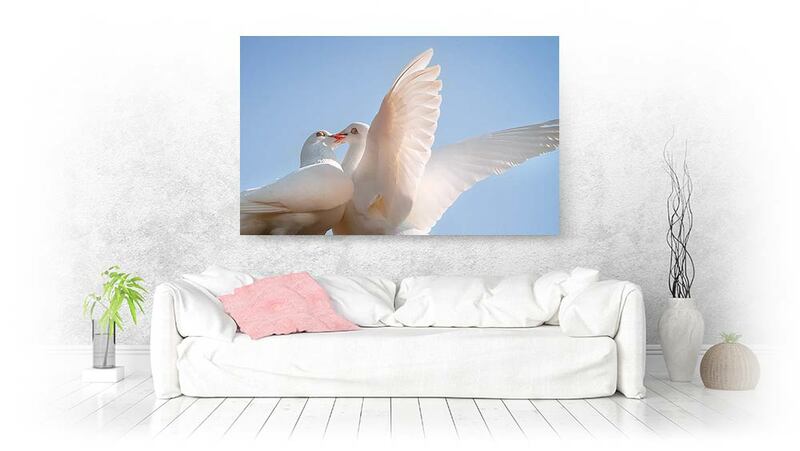 You can now enjoy this unique sight of pure love in your own home, with this birds canvas print. 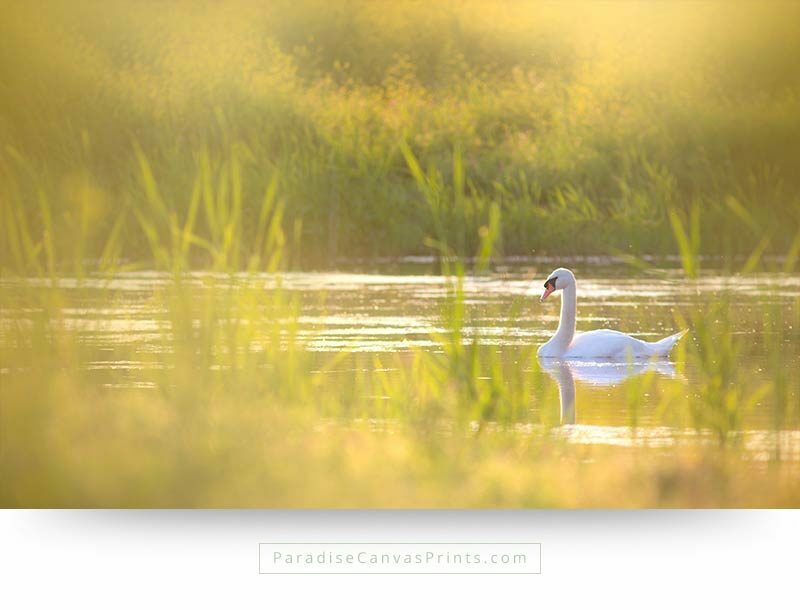 A romantic image of a swimming swan during sunset, when the sun casts a warm light on the scene. 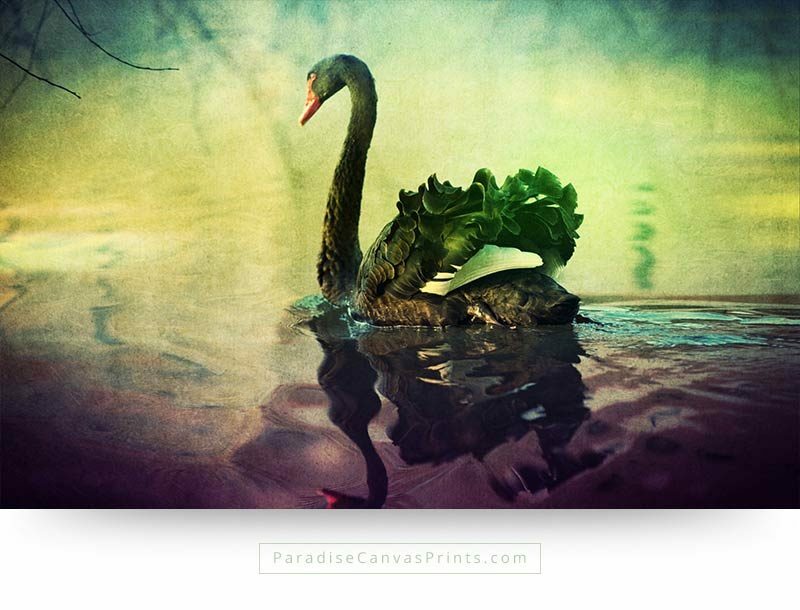 This wonderful work of art shows the serenity and beauty of a swan. 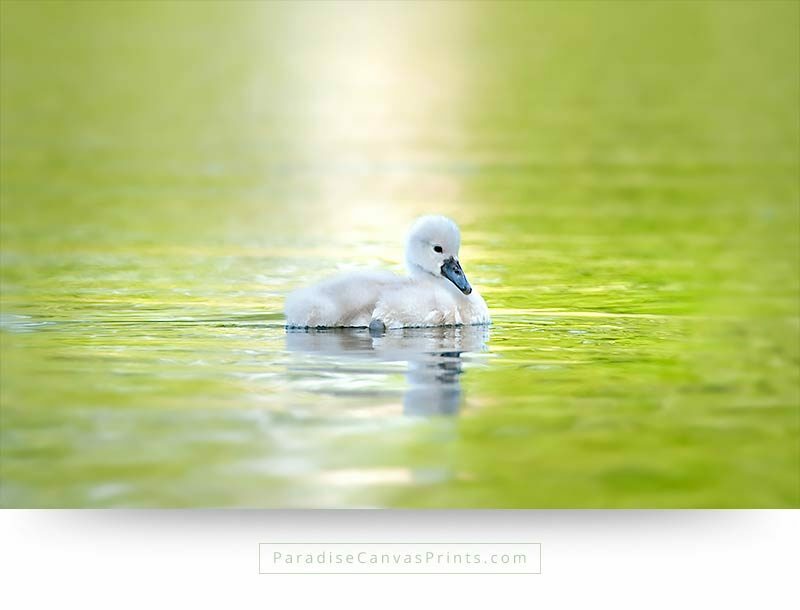 Enjoy this peaceful picture in your home, on canvas print and wall art. This world is literal full of wonders, if we have an eye to see them. While so many spend their lives behing televisions or computer screens, I ventured out into a nature reserve. 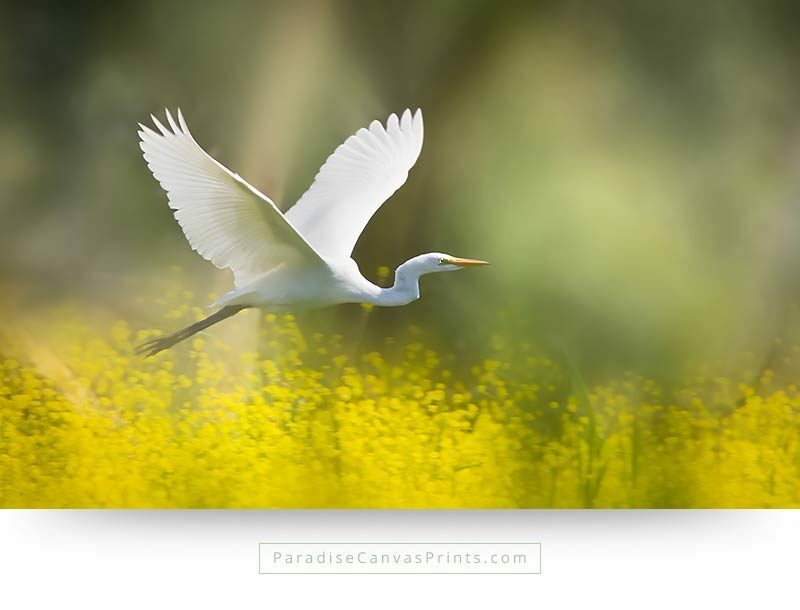 While I was strolling along, enjoying the beautiful surroundings, suddenly a white heron (or egret) took off right in front of me, and flew over a field of yellow wildflowers. 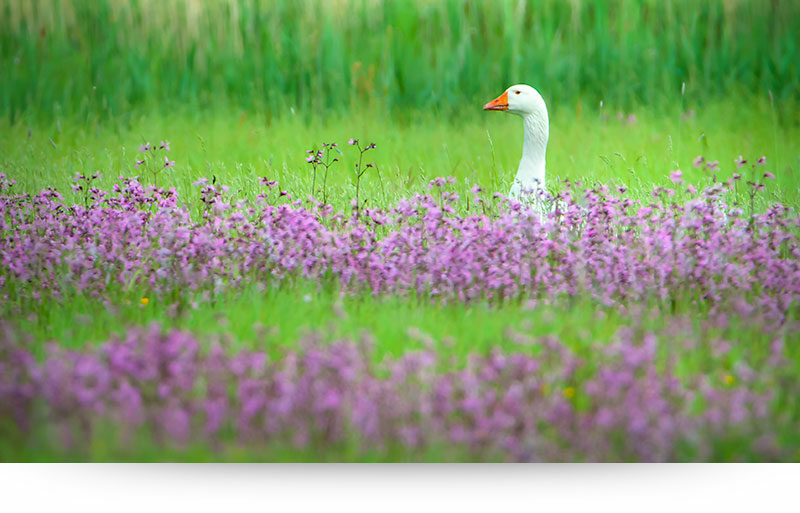 This photograph reveals the swan as a masterpiece of living art. 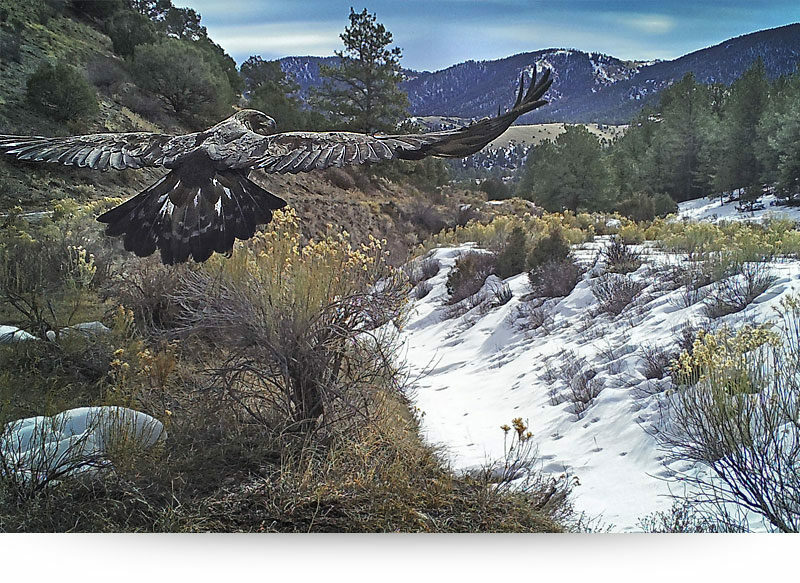 Even when it takes a bath, it’s a spectacular sight. 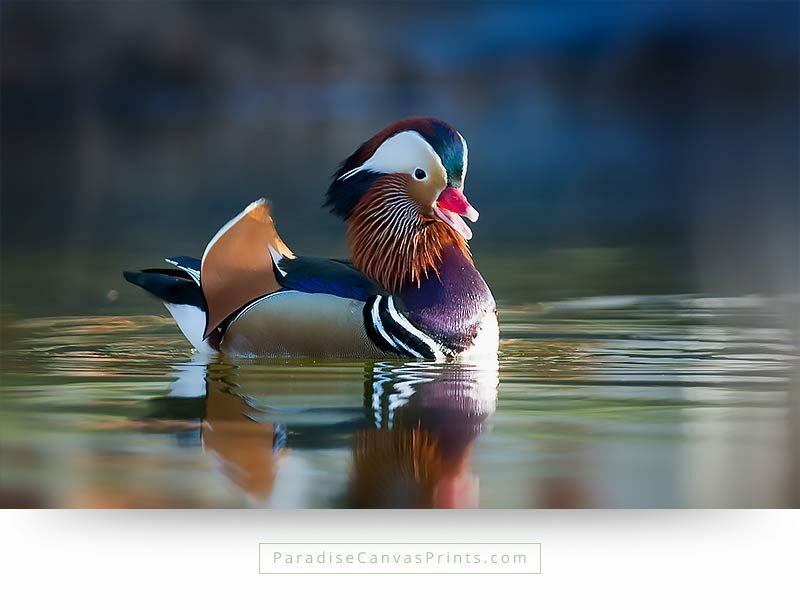 Bring this unique beauty in our home, with a high quality bird canvas print and wall art. The black swan is unique and stunning. 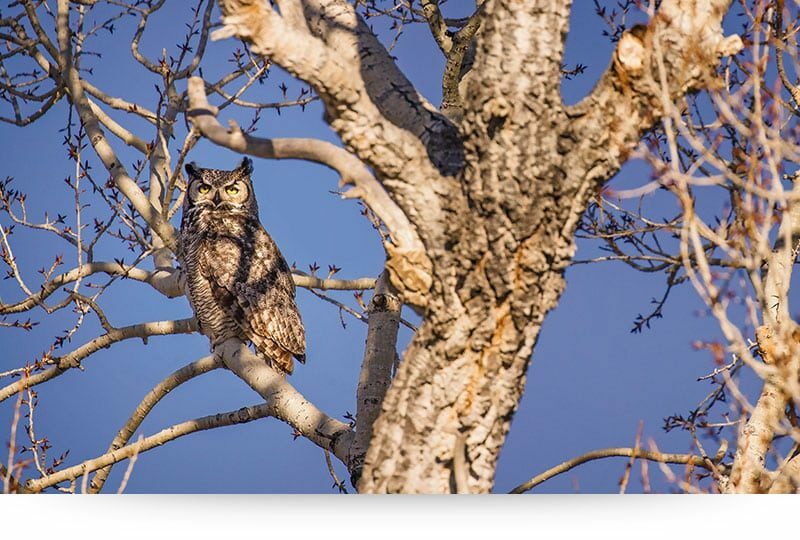 It’s hind feathers are curly and stylish, with white accents underneath. 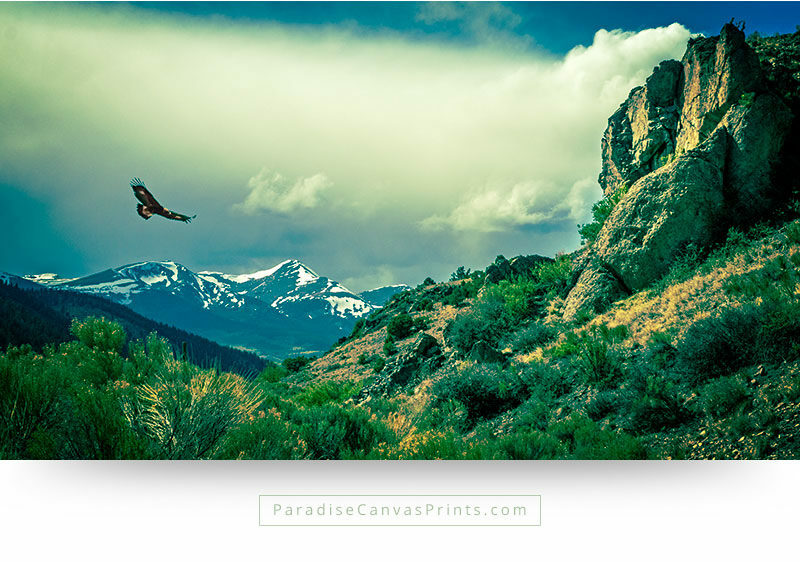 Bring this amazing piece of art in your home, as a high quality canvas print. 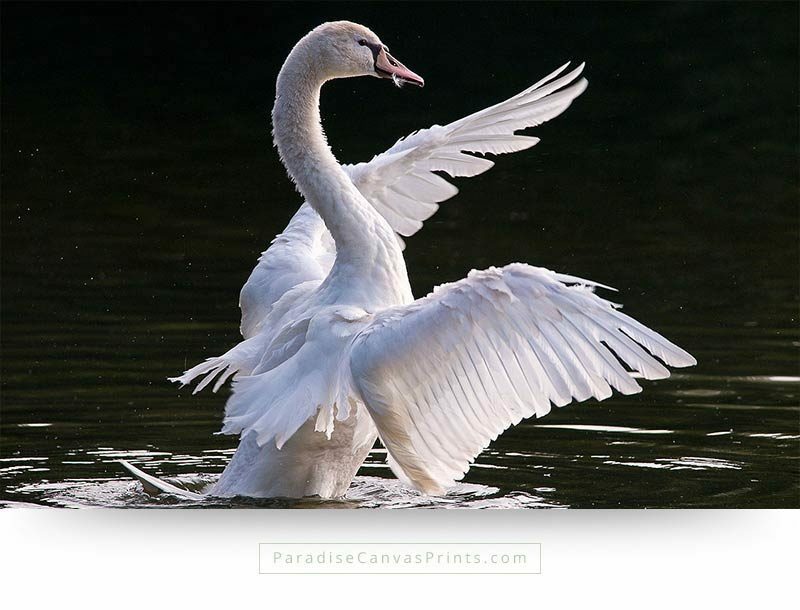 Swans are spectacular birds, unlike any other creature. 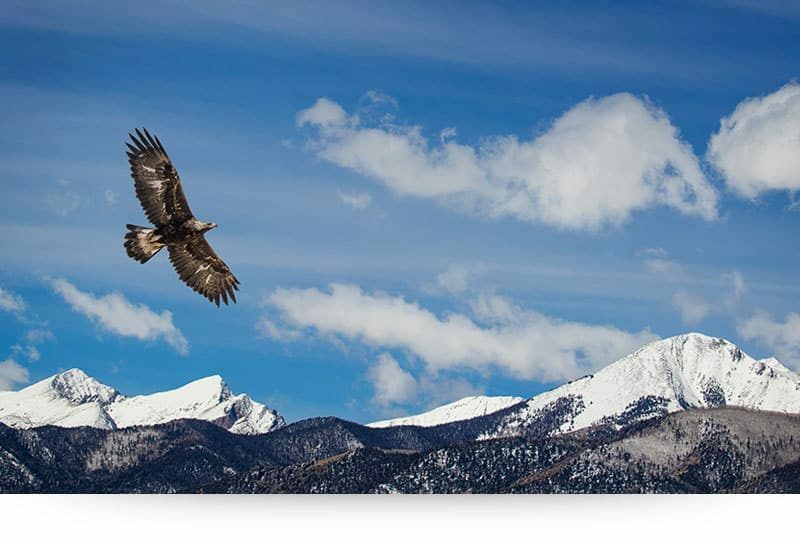 They express both noble elegance as fierce strength. 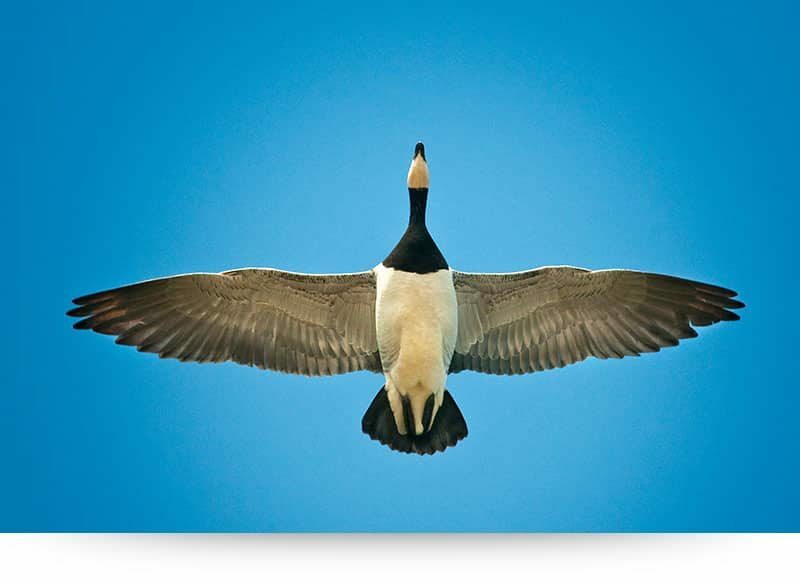 This photograph shows the large wings of a swan, lit up by the sun. 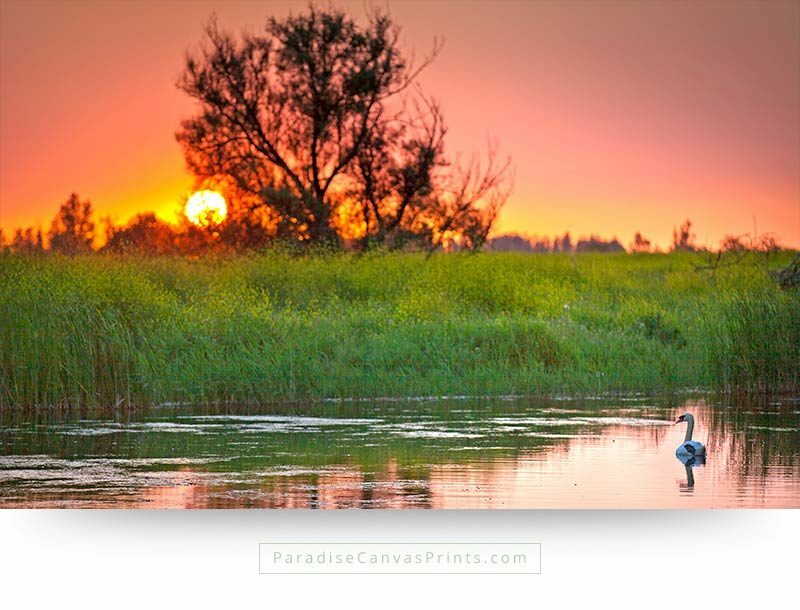 The green nature reserve turns to gold during sunset, and peace surrounds the scene, while the beautiful swan floats calmly on the water. 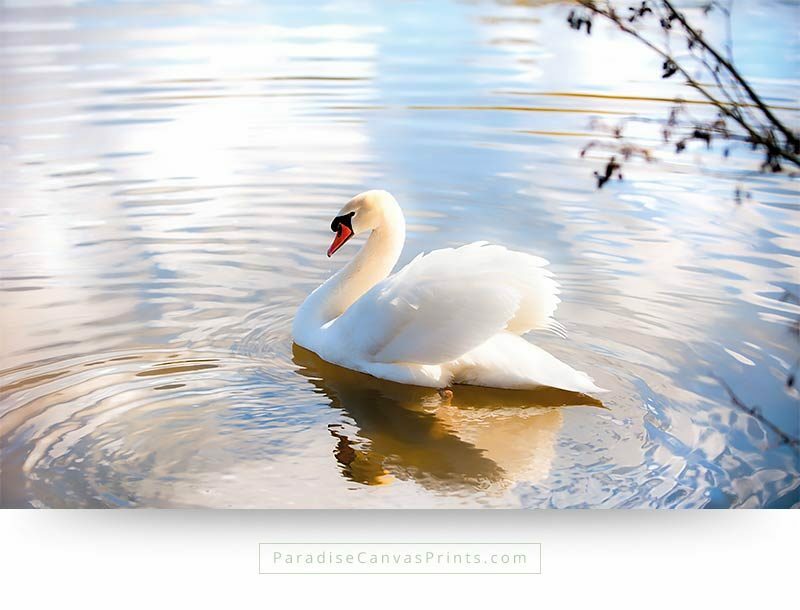 Bring this scene of serenity into your home, as a high quality canvas print. 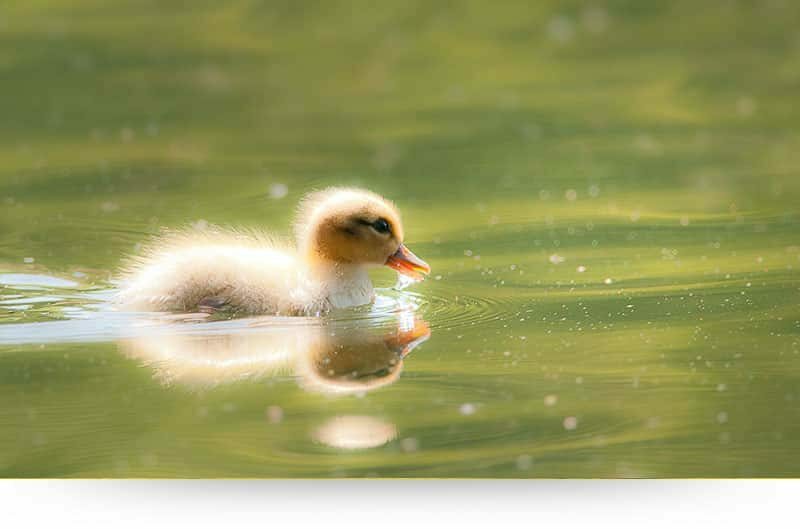 In the world famous fairytale of the Ugly Duckling, a swan chick is bullied because he is so ugly. 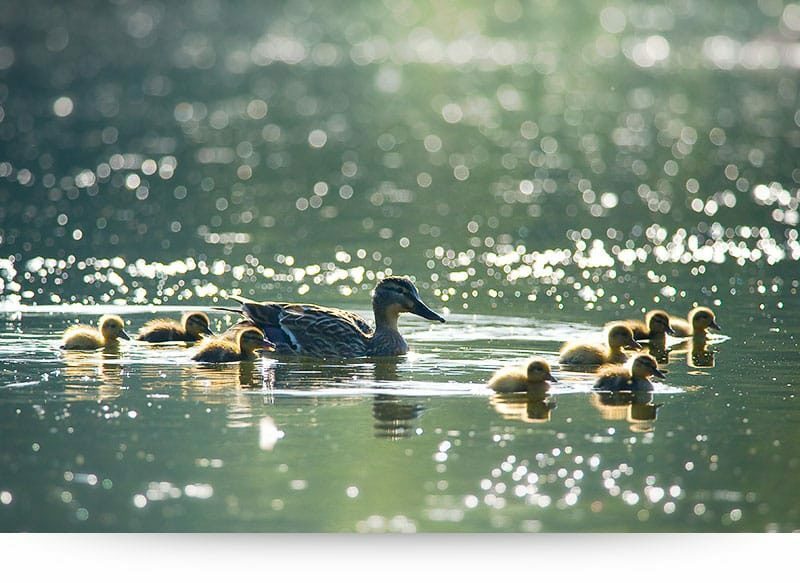 But this swan chick, or a cygnet, is far from ugly… It floats peacefully in the warm light of the setting sun, that casts a wonderful glow on the water. 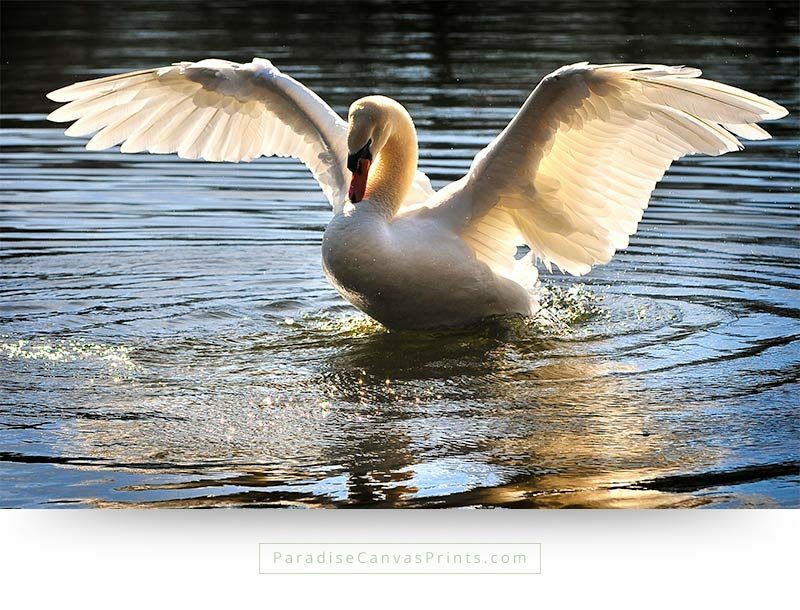 A young swan lifts itself up out the water to stretch it’s wings. With the black background, it almost looks like a music conductor.